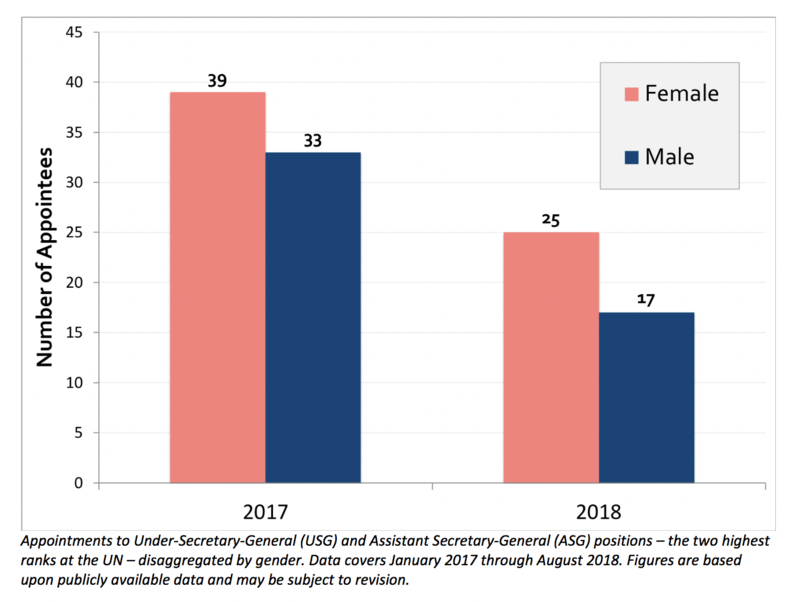 If the UN Secretary-General keeps up the pace of appointments he set in 2017 and 2018 thus far, the UN would reach gender parity among all senior officials by October 2019. It’s no secret that the United Nations (UN) has a gender problem. Historically a bit of a boys’ club, the UN still has more men than women employed at most levels. Some progress has been made on hiring and appointing more women–particularly since Secretary-General António Guterres took the helm in January 2017–but there is still a significant gender gap at many ranks within the UN system. Since change typically flows from the top down in Turtle Bay, it’s especially important that women are equally considered for the highest-level jobs. But is this actually happening? Under the current Secretary-General, the answer is an emphatic yes so far (with the one possible exception of women in the field, as we recently documented). Overall, he has appointed more women than men to fill senior vacancies, which is probably a first for any leader of the UN. 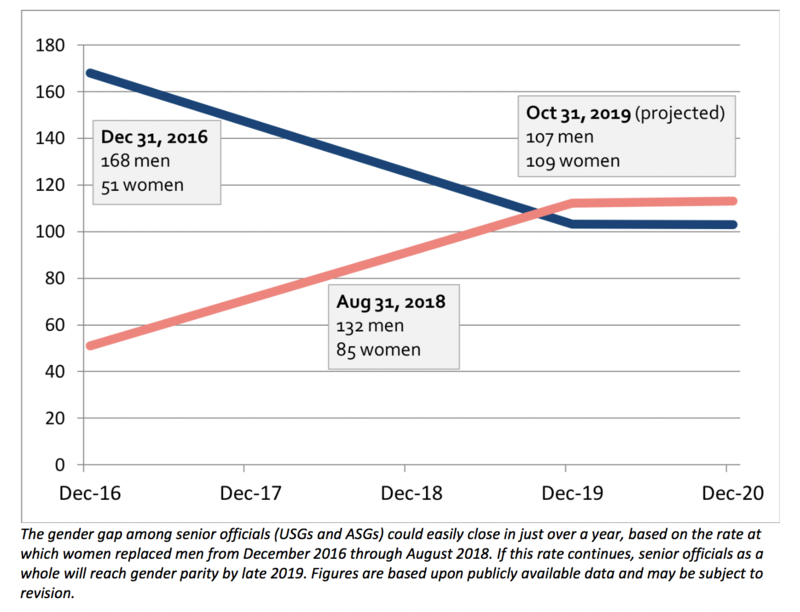 If you are wondering how senior officials collectively can reach parity faster than ASGs alone, it is because the Secretary-General has been appointing female USGs at a faster rate than female ASGs, fast enough for senior officials as a whole (though not ASGs only) to reach gender parity by October 2019. Of course, a number of factors could derail this projection. There could end up being fewer vacancies to fill going forward than there were to date. The rate of appointments could slow if major UN budget cuts materialize. Or the Secretary-General could simply slow his pace of appointing women, reverting to the modus operandi of Ban Ki-moon and other predecessors. Barring these possibilities, however, an optimistic projection would expect to see Guterres achieve gender balance among senior officials by winter 2019 at the latest. When it comes to female senior officials in the field (i.e. in missions led by the UN Department of Political Affairs, Department of Peacekeeping Operations, and Department of Field Support), the projected time until parity with their male counterparts is also October 2019, a trend which has been aided by the winding down of several predominantly male-led peacekeeping missions. There are also considerations such as the size of departmental budgets being overseen by men vs. women, as well as the number of people under their management, which we will explore in subsequent posts.